HMS Renown was a 74-gun third-rate ship of the line of the Royal Navy. 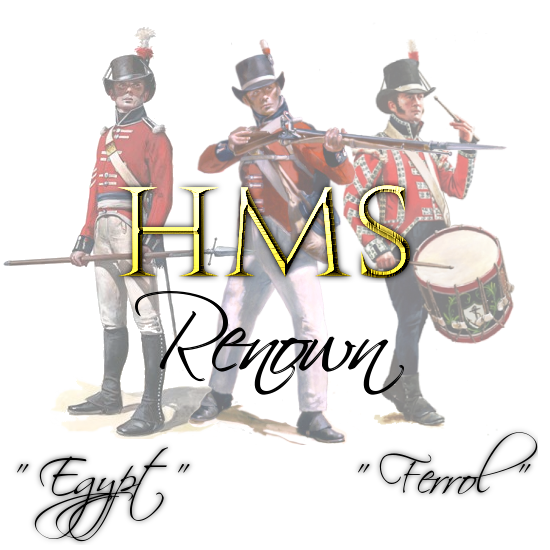 She used to been named HMS Royal Oak, but the name was changed to Renown on 15 February 1796. She was launched at Deptford Wharf on 2 May 1798 and served in 1800-1801 as the flagship of Sir John Borlase Warren, initially in the English Channel. On 1 July 1800, Renown, Fisgard and Defence, with the hired armed cutter Lord Nelson in company, were in Bourneuf Bay when they sent in their boats to attack a French convoy at Île de Noirmoutier. The British destroyed the French ship Therese (of 20 guns), a lugger (12 guns), two schooners (6 guns each) and a cutter (6 guns), of unknown names. The cutting out party also burned some 15 merchant vessels loaded with corn and supplies for the French fleet at Brest. However, in this enterprise, 92 officers and men out of the entire party of 192 men, fell prisoners to the French when their boats became stranded. Lord Nelson had contributed no men to the attacking force and so had no casualties. Next, Renown participated in an abortive invasion of Ferrol. On 29 August, in Vigo Bay, Admiral Sir Samuel Hood assembled a cutting-out party from the vessels under his command consisting of two boats each from Amethyst, Stag, Amelia, Brilliant and Cynthia, four boats from Courageaux, as well as the boats from Renown, London and Impetueux. The party went in and after a 15-minute fight captured the French privateer Guêpe, of Bordeaux and towed her out. She was of 300 tons burthen and had a flush deck. Pierced for 20 guns, she carried eighteen 9-pounders, and she and her crew of 161 men were under the command of Citizen Dupan. In the attack she lost 25 men killed, including Dupan, and 40 wounded. British casualties amounted to four killed, 23 wounded and one missing. In 1847 the Admiralty awarded the Naval General Service Medal with clasp "29 Aug. Boat Service 1800" to all surviving claimants from the action. She then served at the abortive attack on Cadiz. Armed en flute, she transferred to the Mediterranean in 1801, still as Warren's flagship. During this time Charles John Napier, the future admiral, was a midshipman in her. Because Renown served in the navy's Egyptian campaign (8 March to 2 September 1801), her officers and crew qualified for the clasp "Egypt" to the Naval General Service Medal that the Admiralty issued in 1847 to all surviving claimants. In 1803 she was at Malta and in 1805 was under repair at Plymouth. After a further spell in the Channel Fleet (1807-8), she transferred again to the Mediterranean. Siamo un vecchio gruppo di amici e veterani esattamente dal 2012 (qualcuno anche dal 2011) reduci da Mount & Blade Napoleonic Wars quindi la più vecchia community italiana, e abbiamo deciso di imbarcarci per questa nuova esperienza su Holdfast e solcare i sette mari tutti insieme sotto la bandiera dell'Impero Britannico. La nave scelta è la HMS Renown, nave di linea di terza classe. Bonsoir Lecourbe, nous sommes bien, vous? "Forza signorine, Sua Maestà ha bisogno di voi! A bordo della HMS Renown visiterete il mondo, combatterete l'odiato francese, troverete tre pasti caldi al giorno, un'amaca dove poter riposare in santa pace sottocoperta e amorevoli caporali che si prenderanno cura di voi! Cosa aspettate a presentarvi presso il nostro centro di reclutamento, non vorrete mica costringerci a venirvi a prendere nelle vostre case "